Water is the most essential thing in our lives, we cannot exist without it. At the same time, however, contaminated drinking water threatens our lives. According to the WHO (World Health Organisation) waterborne diseases are linked to significant disease burden worldwide. Waterborne diarrhoeal diseases, for example, are responsible for 2 million deaths each year, with the majority occurring in children under 5. In total, they estimate that 13 million people die each year from waterborne infection. We know a range of waterborne diseases that cause different symptoms like diarrhoea, fever or vomiting. The most common bacteria which could infect the water are Salmonella, E. coli, Cholera, Pseudomonas or Legionella. All in all one the most important things to do is clean or decontaminate infected water so that it is “Potable”. Potable water is water that is safe enough to be consumed by humans and other animals and is also known as drinking water. 20/30 Labs are UKAS accredited to test potable water samples in accordance with the Microbiology of Drinking Water published by the Environment Agency and The Water Supply Water Quality (England and Wales) Regulations 2000 SI No 3184 published by the Drinking Water Inspectorate. Tests for coliform bacteria and Escherichia coli (E. coli) are routine microbiological examinations carried out on drinking water. These tests provide a sensitive means for detecting faecal contamination, for assessing raw water quality, the effectiveness of water treatment and disinfection, and for monitoring the quality of potable water in distribution. Enterococci are facultative anaerobic organisms that are part of the normal intestinal flora of humans and animals. Their presence in potable water is also indicative of waste contamination of the water supply. Sulphate reducing bacteria are a group of organisms that produce hydrogen sulphide in anaerobic conditions. The hydrogen sulphide taints the water with an odour of rotten eggs and can cause corrosion within the potable water transport system. Legionellosis is the collective name given to the pneumonia-like illness caused by Legionella bacteria. This includes the most serious Legionnaires’ disease caused by Legionella pneumophila, as well as the similar but less serious conditions of Pontiac fever and Lochgoilhead fever. 20/30 Labs are a UKAS accredited laboratory (4236) for the detection and enumeration of Legionella according to; ISO 11731 Part 2, for the direct plate method and ISO 17731 Part 4, for the three plate method. 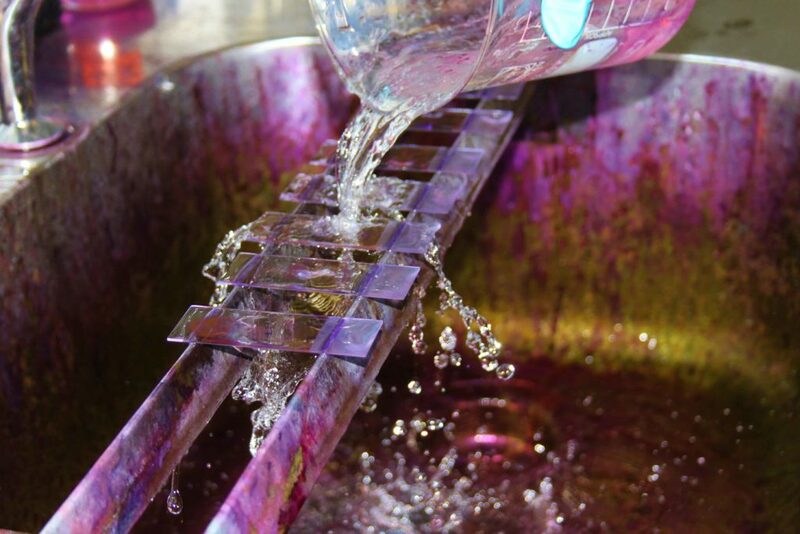 ISO 17731 is used for the analysis of process or waste waters. The presence of Legionella bacteria is analysed by filtering samples onto GVPC agar, a Buffered Charcoal Yeast Extract (BCYE) agar containing the selective agents glycine, vancomycin, polymixin and cyclohexamide (GVPC), and incubating samples at 36°C ± 2°C for a period of at least 10 days. Plates are examined for any growth on three occasions; at Day 4, Day 7 and Day 10. Presumptive colonies are confirmed by their ability to grow on BCYE agar but an inability to grow on non-selective TSA (due to an absence of L-cysteine). Confirmed Legionella can be further characterised using an antibody latex agglutination test to characterise the isolate as Legionella pnuemophila (Serogroups 1 or 2-14), or Legionella species. Pseudomonas aeruginosa is an opportunistic pathogen that exploits a break in the host defences to initiate an infection. Transmission often occurs through contact with Pseudomonas contaminated water, soil and as a result of contaminated medical devices. A variety of guidance documents and standards require that the presence of Pseudomonas aeruginosa is routinely tested in water. Examples include; HTM 01-04 Part B which describes testing for safe water in healthcare premises, HTM 01-06 which described testing for endoscope washer disinfectors and the HPA Spa Pool books for testing Spa Pools. Samples are membrane filtrated onto selective Pseudomonas CN supplemented agar and incubated at 37±1°C for 48 hours. Confirmation is carried out using Milk Cetrimide agar for Casein Hydrolysis and Pyocyanin production. The UK the drinking water standard is at a high level. There are strict regulations for the quality of potable water and they have to be in accordance with the EU Drinking Water Directive. These standards are based on advice from the World Health Organization (WHO) and are regularly reviewed. Independent inspectorates are checking the water quality from time to time to assure the highest water safety.